Available once again on vinyl to coincide with the insightful Maxine Gordon-penned biography that shares its title, Sophisticated Giant was recorded shortly after Gordon's return from a dozen years living abroad in Europe. 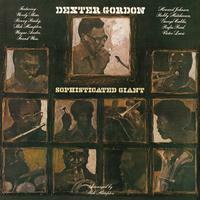 Originally recorded in June of 1977, the album finds Gordon on both tenor and soprano saxophone joined by an all-star "Dextette," 10 crack players including trumpeters Woody Shaw and Benny Bailey, vibes master Bobby Hutcherson, trombonist Slide Hampton, Frank Wess on alto and flute and more. Includes the Gordon original "Fried Bananas," Shaw's "The Moontrane" plus standards such as "Laura" and "You're Blasé" all arranged by Slide Hampton and produced by Michael Cuscuna.